Myers Forklift LLC is a material handling equipment company providing quality products and services to commercial and industrial clients in and around Dowagiac, MI. Our cleaning equipment and forklift experts are factory-trained and certified by some of the industry’s biggest names such as Toyota, Raymond, and Crown. Whether you need to buy equipment or have your machinery repaired, you can be confident that we are capable of dealing with your concerns. 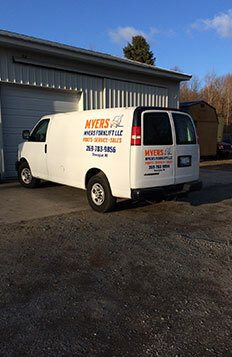 With more than 80 years of combined experience, Myers Forklift LLC has become one of the most trusted commercial and industrial equipment providers in the area. We see to it that we offer only the finest equipment parts and brands available as well as the best imaginable repair and rental services. Rest assured that we will go out of our way to exceed your expectations every time you come to us to buy equipment or have your gear repaired. Contact us today and learn more about our products and repair services. For your queries, you may reach us through phone or email. We have a full-time customer relations team so you can be sure that we can address any concern you have whenever you need it.